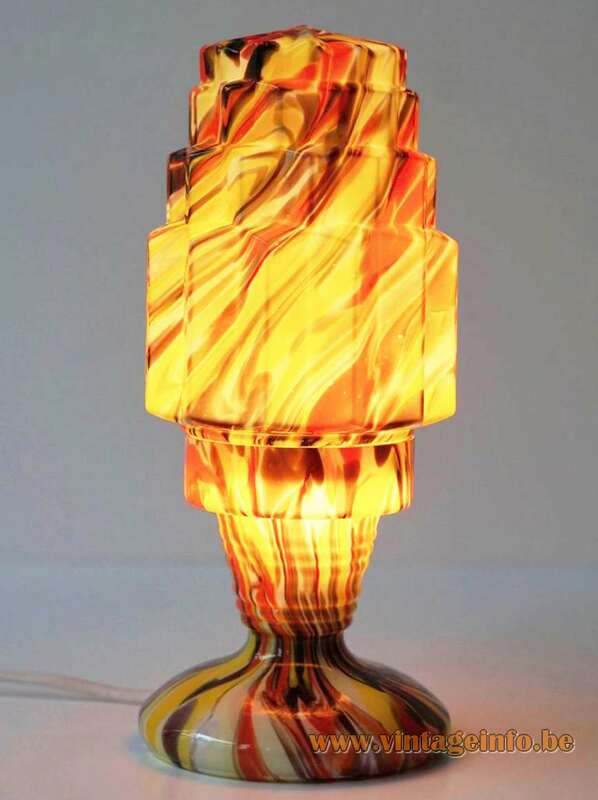 Materials: Skyscraper style lamp made of two parts spatter glass in many colours. Electricity: 1 bulb E27, 1 x 60 watt maximum, 110/220 volt. Any type of light bulb can be used. But preferably a white or frosted bulb. Manufacturer: Wilhelm Kralik & Sons, Eleonorenhain -Christianberg, Bohemen – Today Czech Republic – attributed. 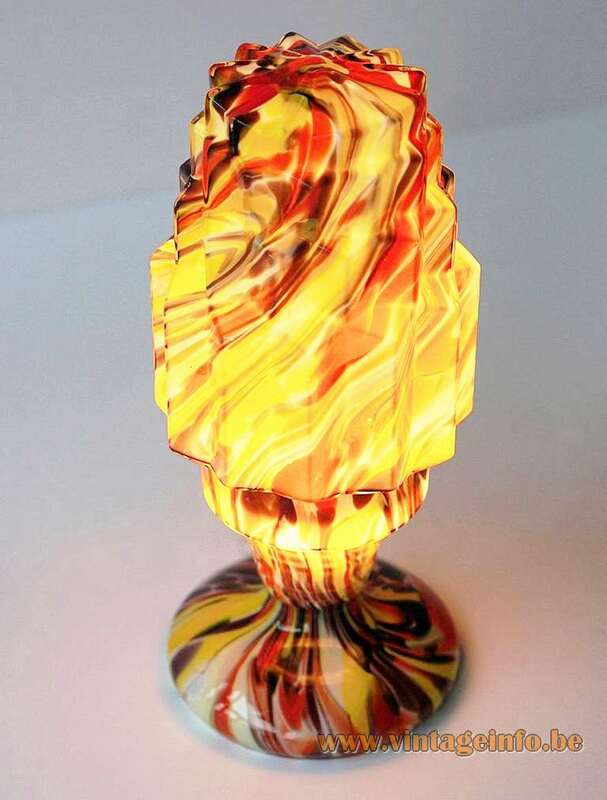 Other versions: None of these lamps are exactly the same, they are hand blown and the colours are all a bit different. Wilhelm Kralik & Sons is originated from Meyr’s Neffe (Meyr’s Nephews) The company was an amalgam of various glass­works brought together. It was founded by Josef Meyr in 1815. Meyr’s nephew, Wilhelm Kralik left the company to his four sons in 1881 (some sources say 1899, 1884 and so on). Two of them renamed it in Wilhelm Kralik & Sons. The two other brothers took over three glassworks and kept the name Meyr’s Nelle. 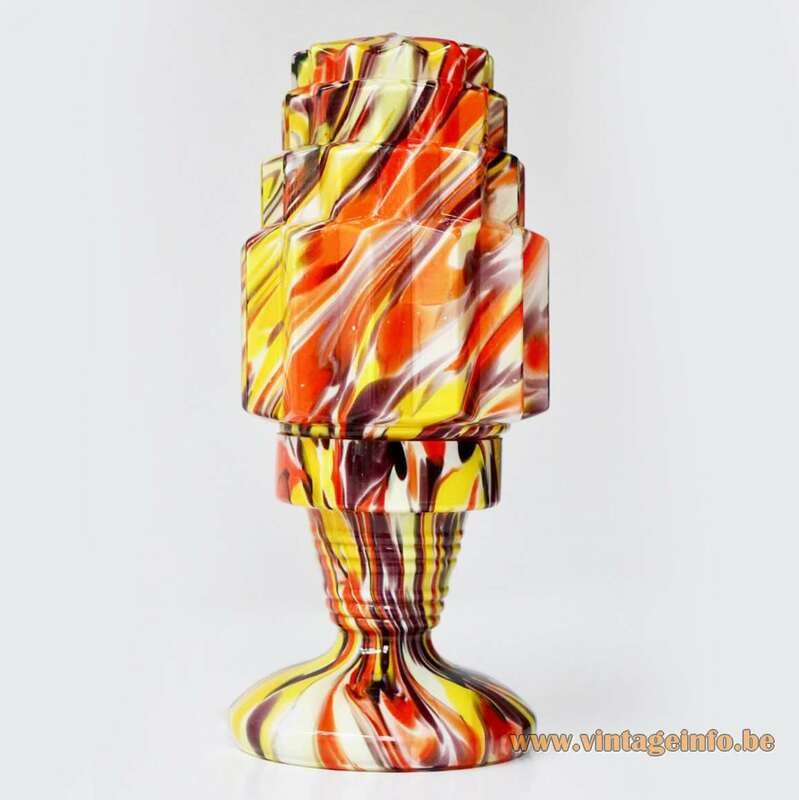 Wilhelm Kralik Sohne continued to produce art glass until World War II. 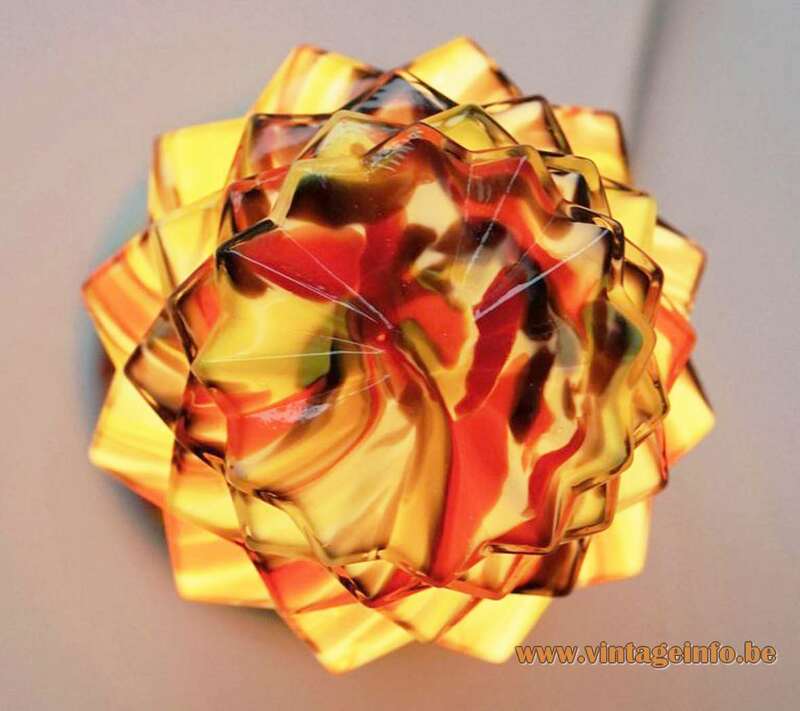 After the end of the war the company became Czech state enterprise under the name Sklárny Český křišťál (Czech crystal glass). In 1993, after the Velvet Revolution, the company was renamed in Šumavské sklárny (Böhmerwaldglas). In 1995 it ended business. Spatter glass, or splatter glass, also known as end-of-day glass or splashed glass, is a technique that has been used for several centuries, and dates right back to the Romans. 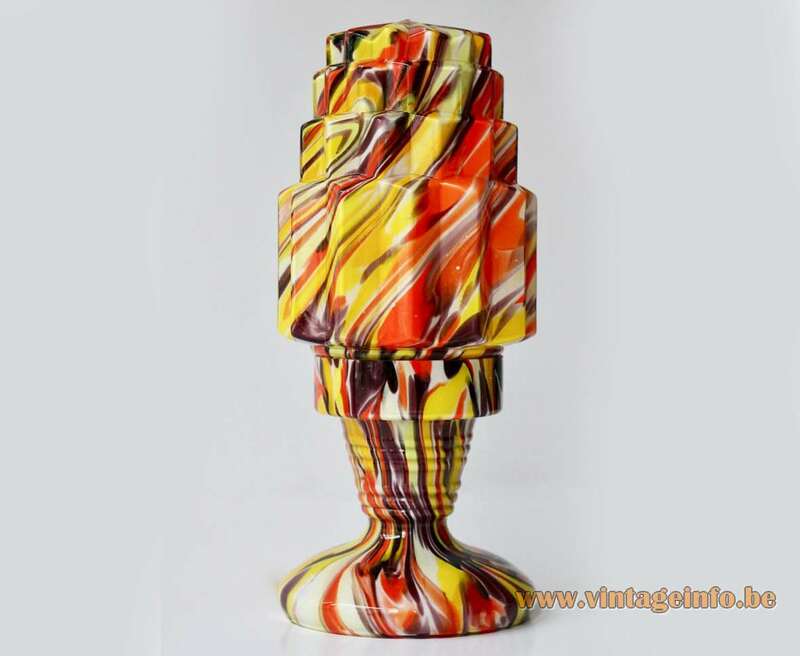 It is hand blown glass which has been rolled over a heated steel plate to pick up small chips of crushed glass or powdered glass. 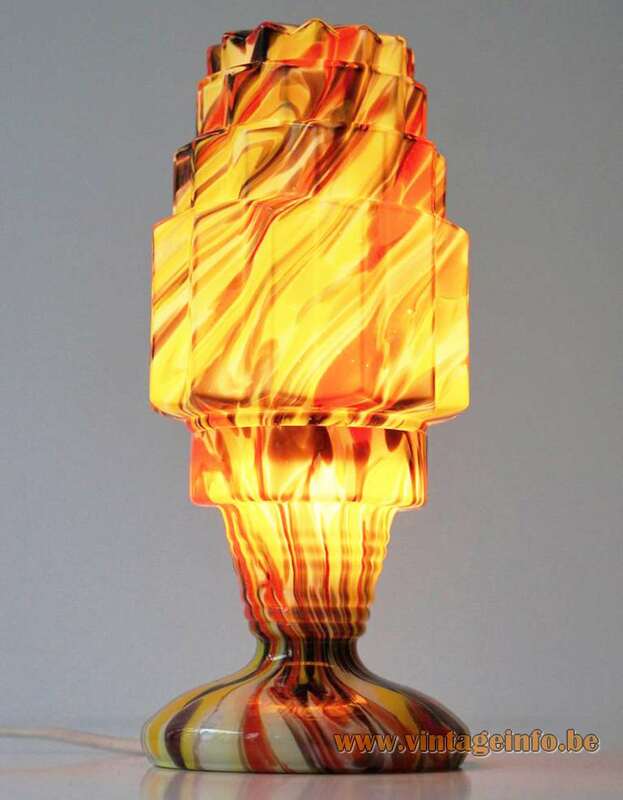 Sometimes said this lamp is made by the Belgian company Scailmont, the “Verreries de Scailmont” (glass makers of) from Manage and it is a design by Charles Catteau (1880-1966), but his designs are all signed. Most of the spatter glass is Czechoslovakian, but it was made across the globe. The most important Czech companies were: Ruckl, Loetz and Kralik.